The way Andrew Flatley sees it, his liberal arts education and the work he’s done in the hard sciences are surprisingly similar. “They both, from different starting points, move toward the same goal of trying to come up with a solution that can help humanity,” he said. That sentiment was echoed in the work Flatley did this summer. 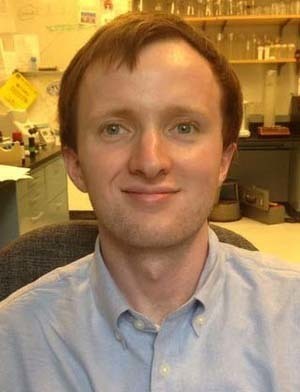 A senior anthropology major, he spent 10 weeks interning in a lab at the Johns Hopkins University School of Medicine, studying mice with Down syndrome. Physiology professor Dr. Roger Reeves and his team are striving to develop a working drug that improves the animals’ cognitive functioning—research that may one day be able to help humans with Down syndrome. “The professor made sure that we never lost sight of the fact that the research we were doing was important—not just understanding something for the sake of science, but because it was going to impact a population that needs our help,” he said. Flatley has long been interested in studying intellectual and developmental disabilities, in part stemming from a personal connection—he has a relative with Down syndrome. In high school, Flatley interned for the LuMind Foundation, which supports research focused on improving cognitive treatments for individuals with Down syndrome. He has also interned at the Matheny Medical and Educational Center in New Jersey, which specializes in helping individuals with developmental disabilities. Familiar with Reeves’ research at Johns Hopkins, Flatley contacted him and inquired about a position at the lab for summer 2015. At Notre Dame, Flatley—who is also a business economics minor—has spent three years as a research assistant in the Department of Psychology Laboratory For Understanding Neurodevelopment (known as the F.U.N. Lab), studying individuals with autism spectrum disorder and the ways they communicate. Working in that environment has been Flatley’s favorite educational experience at Notre Dame, as he found it to be a perfect way to couple his love of science with his College of Arts and Letters education. Studying social communication benefits from both a knowledge of biological inputs and environmental factors as well as an understanding of how they form and shape human relationships. A lot of different things coming together also describes the senior’s academic interests. While taking multiple electives in the College of Science, Flatley has remained focused on the liberal arts, finding great value in discussion-based classes that allow students to debate viewpoints and come up with new ideas based on what they know and what they’ve learned. Anthropology proved to be an ideal major, he said, as it allowed him to study why humans act certain ways and how biology influences their behavior. Its tools and methods have helped him to see ways to improve the application of laboratory-based scientific research, as well. Understanding anything from cultural norms to social cues can help determine how science can improve the human experience. A native of the Morristown area of New Jersey, Flatley is still weighing his future options. His immediate goal is to attend medical school and provide clinical care to patients, perhaps combined with additional laboratory investigations and anthropological research. Whichever path he chooses, Flatley’s strong foundation in the liberal arts will continue to play a role. Originally published by Tessa Bangs at al.nd.edu on October 13, 2015.